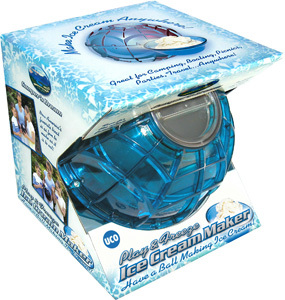 With the unique Play & Freeze™ Ice Cream Maker, you can make ice cream anywhere! 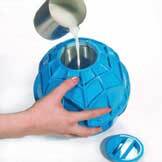 You don’t need electricity, just add ice and rock salt in one end and ice cream mix in the other end–then have a ball as you shake it, pass it or roll it! The ice cream mix can be as simple as cream, sugar and vanilla. Made of durable polycarbonate, it’s lightweight, portable and easy to clean. It’s ideal for Camping, Boating, Picnics, Parties, Travel...anywhere! With our huge variety of ice cream mix-ins you’ll never have to worry about your ice cream being too plain. Just add some sprinkles, crunchy mix-ins, sugar pearls, colorful sugars, or fun shaped confetti toppings. Kids will enjoy adding different colored sugars, or fun shaped confetti to their own bowl of ice cream. Also try adding our different flavored syrups to your ice cream! 1. 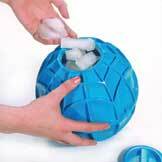 Fill the ice end with as much ice as possible, then add 1/2 cup of rock salt. The lid should be hand tightened - do not use the wrench! 2. Mix up your ice cream ingredients in a container, then pour mix into the end with the metal cylinder, leaving about an inch for expansion at the top. Hand tighten the lid. 3. Have a ball! Shake, roll and pass it around as you mix and freeze the ingredients. Its not necessary to shake the ball...just motion will do it! 4. 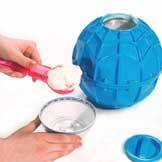 After about 10 minutes open the ice cream end using the included plastic wrench. 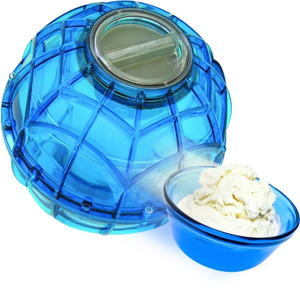 Scrape the sides of the cylinder to mix up the ice cream using a plastic or wooden spoon (don’t use a metal spoon as it will scratch the cylinder). Then check the ice end. Pour out the excess water and add more ice and up to 1/3 cup more rock salt to enhance the freezing ability. 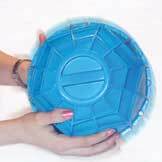 Close the lids securely and continue having a ball for approximately 5–10 more minutes. 5. You now have about a pint (or quart for the MEGA ball) of delicious soft-serve ice cream. The consistency will vary based on the ice, your mix, the outside temperature, shaking frequency, etc. Once the ice cream is to the consistency of your liking, gently scoop it out and enjoy! Directions and recipes are inside the Ball. Use cream instead of half ‘n’ half for richer tasting ice cream. Leave about an inch of space for expansion when you fill up the can with the ice cream mix. After 10 minutes of mixing (shaking, rolling, passing), its important to stir the ice cream mix (it freezes more around the can). Also drain the water and refill with ice and additional rock salt. Have fun for another 10 minutes and you’re done. 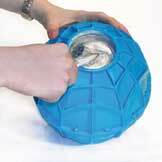 Use the provided plastic wrench to open the ball, but not to close it.